The latest Culture, Medicine and Psychiatry is a special issue on “Trauma and Idioms of Distress,” co-edited by Devon E. Hinton and Roberto Lewis-Fernández, who write that the issue “focuses on the role played by idioms of distress in the local trauma ontology, the associations between the idioms and psychiatric disorders occurring in the context of trauma and the mechanisms by which the idioms profoundly influence the personal and interpersonal course of trauma-related disorders,” (2010). In addition to a number of articles reporting on ethnographic and clinical research, the issue includes a reflection by Mark Nichter, who first developed the concept of idioms of distress during the late 1970s and early 1980s. 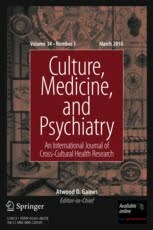 Raikhel E. "Trauma and Idioms of Distress": a special issue of Culture, Medicine and Psychiatry. Somatosphere. 2010. Available at: http://somatosphere.net/2010/trauma-and-idioms-of-distress-special.html/. Accessed April 26, 2019. Raikhel, Eugene. 2010. "Trauma and Idioms of Distress": a special issue of Culture, Medicine and Psychiatry. Somatosphere. http://somatosphere.net/2010/trauma-and-idioms-of-distress-special.html/ (accessed April 26, 2019). Please, can I have a copy of this book? I am doing a Master of Medical Anthropology in Uganda and would really love a copy of this book.